Dropzone has been often cited as one of the best Defender variants of all time, even going as far as saying it's even better than its source of inspiration. 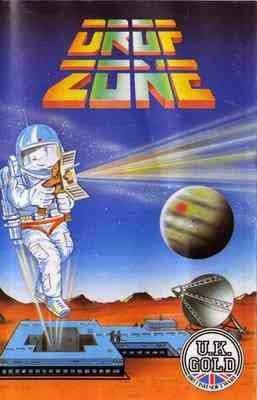 At the time of release, Dropzone was given rave reviews on both C64 and Atari press, and today, it's still highly regarded by retrogamers. 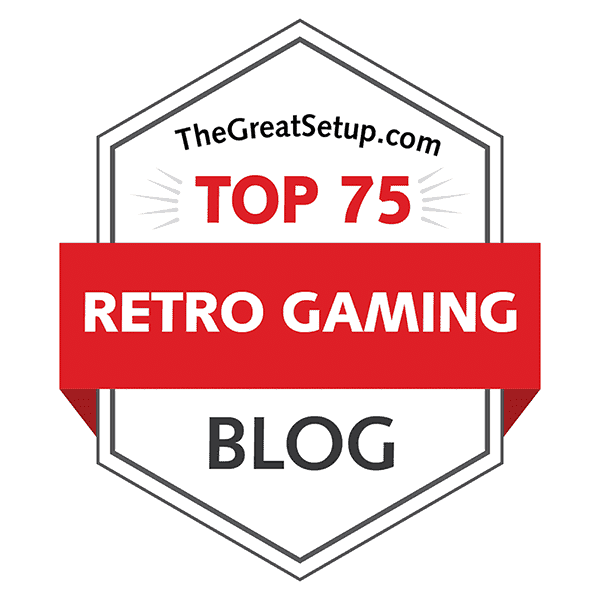 The Atarimania section for the 8-bit computers has it currently at number 4 on the visitors top ratings list of all time with a spectacular 8.8 score from a total of 1,858 votes, and the C64 version has a 7.7 from 107 votes at Lemon64. Rest of the scores are taken from MobyGames: NES - 1.6 with 1 vote; Game Gear - 2.7 with 2 votes; Game Boy - 4.7 with 2 votes; and Game Boy Color - 3.8 with 1 vote. Not very convincing, but it's something. For most casual retrogamers out there, Archer MacLean would probably sound the most familiar in context with his later hit titles, International Karate and it's even more famous sequel. Dropzone was not only his commercial debut, but also the first game he ever set on to program at all. Considering the high status the game still has, I'd say we're talking about a seriously ambitious game developer here. After his International Karate games, though, he only made Jimmy White's Whirlwind Snooker on the 16-bits, and since then, has only been involved in the various remakes of Dropzone and IK, so I wouldn't exactly call him a particularly inventive one. Dropzone cannot be properly described without having played Defender first, and to be honest, my acquaintance with early arcade shooters is shoddy at best, so I had to give myself a brief history lesson that has been woefully long time in coming. Therefore, I apologize if this entry feels more like a versus battle between Defender and Dropzone instead of a comparison between versions of the same game, but until a certain point, I believe it needs to be just that. 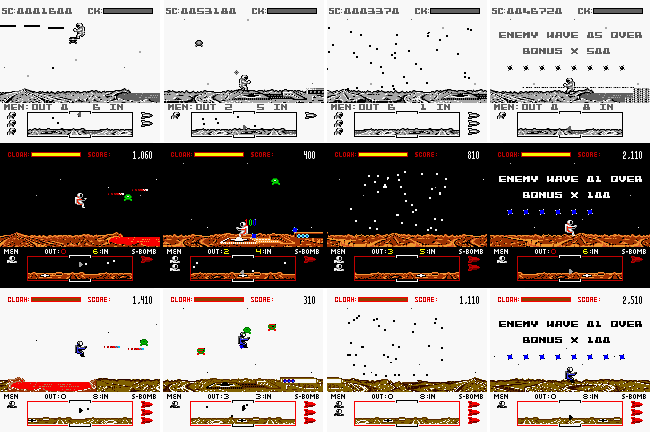 See, the two games are unmistakably very much alike in the basic idea and execution - you fly a spacecraft (or in case of Dropzone, a spaceman wielding a jetpack) in a horizontally and bi-directionally scrolling circularly wrapped area, while shooting at alien spacecraft and rescuing your planet's inhabitants from the claws of alien invaders. But although the idea is basically the same, it's the gameplay that has all the difference what makes Dropzone feel exactly what Defender should have been from the beginning. I'll explain it all to you as well as I can in the next section. There is no denying, that like Defender, Dropzone is a very difficult game. It's one where your hand-eye coordination skills must be honed to perfection, and your familiarity with your controlled character's controllability has to be better than your familiarity with the contents of your trousers. For a beginner, it can feel a bit overwhelming at first, but simultaneously, Dropzone has a high probability factor of getting you hooked into it. I would say it's a highly recommendable game to any shooter fan, but gamers with low reaction times will very likely have a hard time getting themselves to enjoy it. One cannot deny that Defender was innovative at the time. When it was released in early 1981, there was nothing like it on the market. It was the first shoot'em-up game to feature bi-directional scrolling, a minimap and a second active goal. But it had its own share of problems as well, such as the randomly acting hyperspace function, which might send you to a straight collapse with an enemy. My personal favourite thing to hate about the game is the stupidly narrow laser beam that your ship fires, because you have to be firing all of the time to have any sort of chance of hitting anything at all. It doesn't really help that you can also shoot the men you're supposed to be rescuing. Unfortunately, both of these elements are kept in Dropzone, which doesn't help with writing my comparison. What Dropzone has much to recommend itself over Defender, though, is one simple thing: the controls. Whereas in Defender, you turn your spacecraft around by pushing a "reverse" button, you can just steer your jetpacking spaceman in Dropzone. Also, your spaceman is always at the center of the screen here, while the spacecraft in Defender is at either end of the screen, depending on your direction. Besides, Defender has a joystick and five buttons, while Dropzone only requires a joystick and two additional buttons from the keyboard. Sort of makes it easier, I suppose. But then again, in Defender, your spacecraft just sort of floats in spot if you don't do anything, whereas Dropzone gives you inertia and gravity to deal with. And with gravity, you get an additional difficulty in getting your jetman stay on level above the ground when rescuing the wandering blue inhabitants of your planet, because your man bounces off of the ground (or more precisely, the drop-off level) if he has to fall from any height. Instead of having an hyperspace jump function, you have a cloaking device in Dropzone, which allows you to go on a hunting frenzy with no fear of getting killed for a small period of time. The cloaking device then recharges for a longer while before you can use it again. The difference about rescuing your planet's fellow citizens here is that while in Defender, you have no need to actually deal with the citizens until they get captured, in Dropzone, you must pick them up and drop them at the clearly assigned dropzone. So the most effective way to clear out a stage is to kill all the enemies first with the cloaking device on, as far as you're able to, and then rescue all your citizens. For further aidance in both games, you can use a Strata Bomb to kill all enemies on the screen at once. And speaking of enemies, there are 8 types of enemies in Dropzone, while Defender only has 6 types. And although I'm sure there are some aspects in both games that I haven't mentioned yet, herein concludes my comparison of Defender and Dropzone. 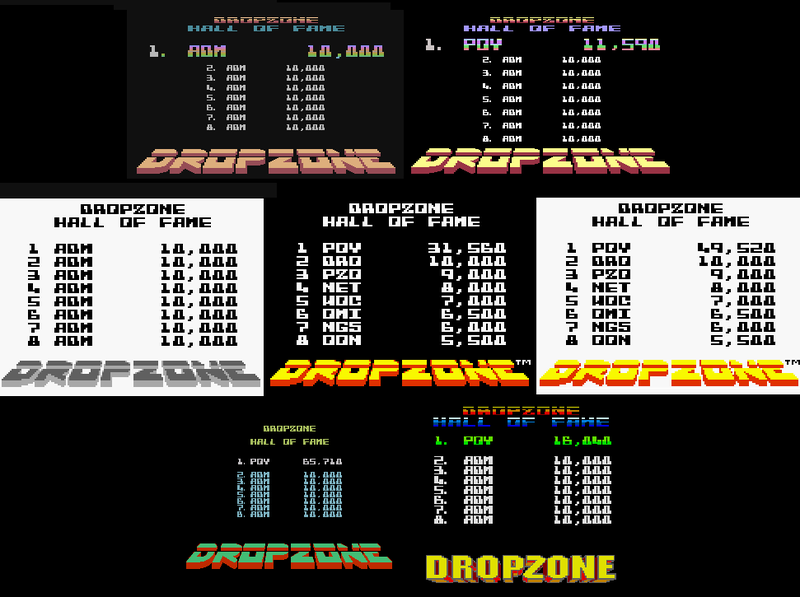 Now, the comparison of the six versions of Dropzone begins with comparing the two first ones. Since both versions were written by Archer MacLean himself, you could expect a high percentage of similarities, and of course you would be correct. As it is well known, MacLean developed the game on an Atari 800, and converted it for the C64 shortly afterwards. Here's a famous direct quote from the creator himself, taken from Zzap!64 magazine issue 5: "Those who can reach Megastar status on the 64 should have had enough practice to attempt an Atari supervised Dropzone mission. The Atari, being the Porsche of home computers, is capable of running Dropzone 2.5 times faster than the 64 and can handle any amount of blobs on screen, even when you release a Strata Bomb. It is visually, sonically etc, identical and about 12K shorter. However, the 64 is still a respectable BMW316." Well, I'm not sure if I'd put it exactly like that, but he might have a point about something. Read the whole article - a guide to playing Dropzone - from the Zzap!64 magazine's web archives: PAGE 1 and PAGE 2. I admit to being still very much a novice, and I can barely get further than the 3rd wave on either of the originals, and you need to be able to complete at least the second wave in order to get to the high scores list, so I'm not able to confirm MacLean's comment on skills. I shall have to take his word on it. The other versions are notably easier. There are less enemies on your radar in the early stages, the action isn't quite as frantically quick, but most notably, your laser beam is a bit wider so it's easier to hit things with it. Either it's because none of the Nintendo hardware couldn't reproduce such small pixels, or because MacLean had gotten enough of hatemail for making the game too damn difficult because of the irritatingly thin laser beam. I'd be more willing to bet on the issues with hardware, to be honest, because the fanbase for this game seems to be almost religiously supportive of the originals - particularly the Atari version. Although both the Game Boy versions suffer from a similar lack of screen width as the Game Gear version, the latter has some additional graphical differences that affect the gameplay in a small way. Your jetman is proportionately larger to all the other things on the screen, the screen feels slightly zoomed in compared to the other versions. Because the game is still very quick, you're going to have a difficult time not bumping into anything hostile, but happily, the level of difficulty is otherwise very similar to all the Nintendo versions. So in a way, the Game Gear version has been balanced to be closer to the originals in difficulty and style of gameplay. The basic gameplay is very much the same in all the latter editions of Dropzone, only the screensize and proportions are a bit different. I'm not really sure if it makes all that much difference, since the gameplay is quite frantic in any case. If it weren't for the Game Boy versions being even easier than either the NES version or the Game Gear version, I would have said all the handheld versions were equal, but as it is, I'd say all the Nintendo versions are equal in their own particular way. To make things easier for all you retrogamers out there, who might be eager to test this game out on all machines, here's a quick guide to all the controls. For more detailed instructions, consult the game's instructions manual. Fire button - fires one laser pulse for each up and down motion. Joystick - up and down for vertical thrust, left and right for horizontal. Space bar - detonates a Strata Bomb. Any button other than ESC (Atari) / F1 (C64) or Space bar - toggles the cloaking device. ESC (Atari) / F1 (C64) - pause. D-pad - does what joystick does above. button A - fire button. button B - Strata Bomb. Select - toggles the cloaking device. button 1 - fire button. button 2 - Strata Bomb. buttons 1+2 - toggles the cloaking device. The thing is, Dropzone was designed to be played with a joystick - and a proper joystick at that. Archer MacLean himself has said that the best sorts of joysticks are "ones that give a nice tactile click when they've switched into position and have as little movement from side to side as possible. This is because some of the big waggly ones give no idea as to what position it's in unless you look at the screen, by which time you've been blown up." So basically, if you have a QuickShot II or worse, you won't be expected of getting past the first wave. Personally, I think space shooters all look alike in one way or another, so forgive me if I'm not all that impressed by any of the graphical elements that Dropzone has to offer. I do admit that the scrolling is fast and smooth enough to be called spectacular, particularly for its time, but I don't really think the game essentially looks any better than, say, Choplifter or Armalyte. Now that I've gotten that out of my chest, let's start this section properly. Loading screens and intro/credits sequences. Top row, left to right: Atari 8-bit, Commodore 64, NES, Sega Game Gear. I decided to forgo the loading times comparison section this time (the Atari tape version takes over 10 minutes to load while the C64 tape loads in 3 and a half minutes), because there were more cartridge-only versions out there than tapes or disks. So the loading screens are clumped in with all the other start-up screens in all the versions out there. This will have no effect on the graphics comparison as such, you can consider it just a little bonus. Title screens. Top row, left to right: Atari 8-bit, Commodore 64, NES. Middle row: Sega Game Gear. Bottom row: Nintendo Game Boy / Game Boy Color. The game starts with a brief animation sequence of the Dropzone logo coming down from above the screen borders in a flat angle, and midway through the screen, it slows down and turns slightly towards the camera and settles itself at the top of the screen. Then, the credits and the adversary list comes on the screen. 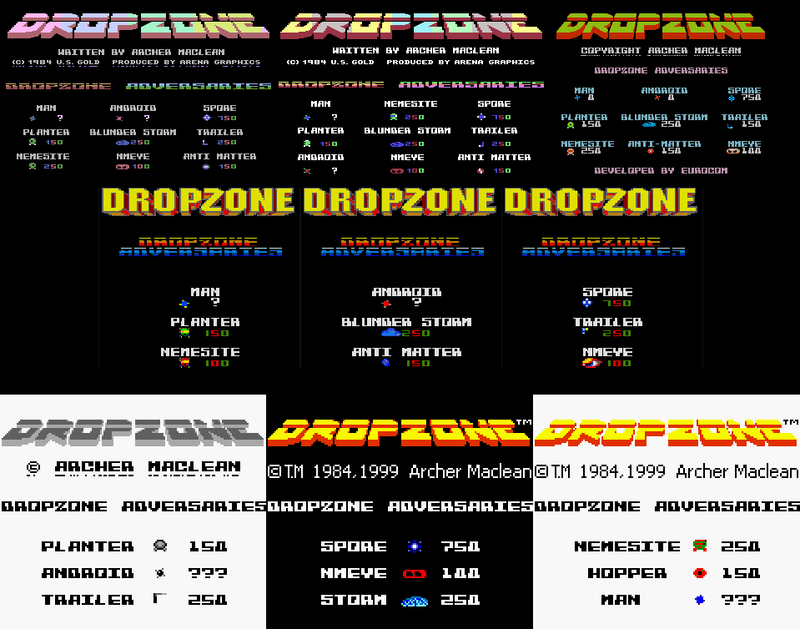 The Dropzone logo and the "Dropzone Adversaries" text scroll colours in different ways; at least they do in the original versions and on the NES. The only effect that the handheld versions have intact from the originals is that the adversaries are animated, but because of the screen resolution, they need to be shown in three groups of threes. High score tables. Top left: Atari 8-bit. Top right: Commodore 64. Bottom left: NES. Bottom right: Sega Game Gear. Middle row, left to right: Nintendo Game Boy, Game Boy Color - black version, GBC - white version. If you wait for long enough on the title screen, the screen will clear out apart from the game logo, which will drop down in a machine-specific way, and settle itself at the bottom of the screen. Above it will be formed the game's high scores list (or Hall of Fame, if you will), which in most cases will do the multicolour effect on the screen titles. Also, in most cases, the player ranked at #1 will be shown with some sort of a clear separation from the others - only the Game Boy versions have the list completely solid and boring. The transition effect on the ATARI is probably the most impressive, if you can consider any of them particularly impressive. For two reasons, I didn't take screenshots that are particularly busy: because I'm not very good at playing Dropzone, and because when it becomes busy, taking screenshots without an additional hand or two becomes nigh on impossible. In any case, the game is meant to be seen in action, so any solid screenshot is useless at making the game seem as exciting as it really is. Because of this, I have decided to break my own rules a bit and include video links for all versions separately, and without asking for permission. If any of the video posters are somehow offended with this, you are free to consider yourselves a stinking pile of cowpat. In-game screenshots from the Atari 8-bit version. Only as screenshots, the original ATARI version of Dropzone doesn't really offer much to look at. Yes, you get the picture: the game takes place in the "airspace" of another planet, which is clearly of a volcanic sort. Only the lava looks curiously grey here, but I suppose in outside of our more familiar Earth, anything is possible. But then, apparently the volcano will erupt if you fail to rescue any civilians, so there's a possibility that something will happen in a rather graphical manner, but I have yet to witness this occurrence, because I always manage to die before anything like that can happen. Perhaps some YouTube clip will show this happening - here's a random YouTube link for the original, if you care to see the game in action. If you do, you can see quite clearly that there's lots and lots of flash effects and fancy colour usage going on in the game, which cannot be captured by mere screenshots. Otherwise, the basic layout is as it is on the Atari: about 75% of the screen is taken by the action, while the bottom 25% has a radar map screen, mission status display, score display, lives and Strata Bombs indicators and the cloaking device power indicator. The C64 version looks only marginally different in both still shots and video. The screen is slightly wider, but a bit lesser in height, but this is actually a good thing, since you are allowed to see more of the action in width, which is more important. This is also reflected in the lower section of the screen with the indicators and all that. Both the ATARI and C64 versions have some differences in colour and detail, but it's really in the speed of the game and the special effects that the ATARI has a small upper hand. Whether you like one version over the other is entirely your own business, and will most likely reflect your capabilities as a player, but speaking strictly in performance terms, the ATARI version wins this battle by an inch. In-game screenshots from the NES version... with slightly corrupted graphics. There didn't seem to be a completely working combination of any NES emulator to go with any of the cartridge image files, so unfortunately the screenshots are slightly garbled at the bottom. Fortunately, you can see the game in action on YouTube with no garbles or glitches. It's a bit of a double-edged sword, this one. 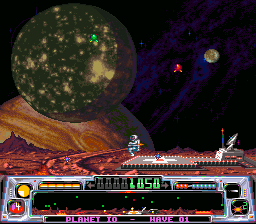 In action, the game doesn't look quite as flashy and colourful as the original, but the sprites and background graphics are slightly upgraded. For a conversion released as late as 1992, the upgrade isn't a particularly impressive one, but at least the game doesn't look like 98% of all the other NES games with clearly tiled graphics. Against my better judgment, I actually like this one better than the originals, but it doesn't mean I will actually give it a better score. In-game screenshots from the Nintendo Game Boy (top) and Game Boy Color (middle/bottom) versions. Because I am such a lousy shot, I was very happy to find out that the lower screen resolution on the GAME BOY made the game easier to play. Of course, the lower resolution also make the graphics a bit blockier than what they were 8 years before on computers of lower tech hardware, but not by much. And then the strictly grayscale graphics on the original Game Boy don't really allow for much colour. It took Nintendo six years (from the release of this game) to launch the GBC, so it took about seven years before the GB version of Dropzone was upgraded to a colourful version - 15 years after the original game was released! And still, it wasn't much of an improvement. What the new version changed graphically to the actual game was not much more than the score and cloak display at the top of the screen, which were now flipped from the original Game Boy version, and some of the texts were also made in a different font. Also, the GBC version was compatible with the old Game Boy, but the white background option on the GBC is just that - an option for the GBC. If you try to play the GBC cartridge on the original Game Boy, you will get to play a version otherwise identical to the original GB version, but at the top of the screen, the score display and cloak display have swapped placed. Anyway, considering the hardware, the GB Dropzone really looks only as good as you would expect it to: rather good, but not quite as nice as the non-handhelds. In-game screenshots from the Sega Game Gear version. Finally, we get to the GAME GEAR version. As I mentioned earlier, the main character is bigger here, and seems to take more room in a smaller screen. I've found out that the reason for this is, that there was originally a conversion in the making for the Sega Master System, which featured upgraded, more detailed graphics, as you see here to some extent. The difference in screen resolution between the SMS and GG wasn't taken into account when doing the conversion, so the Game Gear players are stuck with a bigger player sprite. Sure, it looks rather nice in action, but it's not very suitable for the screen. Even when compared to the GAME BOY versions, which are already a small step in the wrong direction, the GAME GEAR version looks very awkward and clunky beyond the redrawn and reanimated sprites. Enter your name for the Dropzone Hall of Fame. Top row, left to right: Atari 8-bit, Commodore 64, NES, Sega Game Gear. Bottom row: Nintendo Game Boy / Game Boy Color. One of the most peculiar things about this game is the strangely psychedelic screen where you get to enter your name on the high scores list. The level of psychedelia is in straight relation to the release date of the game - the older the release, the more you get for your money. Only the GAME BOY versions don't have any of that, and they don't even give you a ranking as the other versions do. Also, if nothing else has proven you so far, then it is this where the ATARI shows its capabilities in the use of colour, at least where this particular game is concerned. When the game designer is so well in terms with the machine that the game in question was originally designed for, it will come as no surprise to anyone that it is where the game is most at home in all areas. Although the C64 version comes very close to the ATARI original, it just doesn't quite match. Still, it's better than the NES, where the action within all the action is clearly of a lesser volume. And quite predictably, the handhelds are what they are. The main focus for MacLean in originally making Dropzone was clearly on all the mechanics and minute details of gameplay, so it shouldn't come as much of a surprise to anyone, that there was no music in the original game. I haven't found out whether it was because there was no room for it, or because MacLean being solely responsible for the game didn't have the ability to write music, or because he didn't want to have any music in the game. It does seem like a conscious choice to not have any music, because that way, it feels more like an early arcade game - most coin-ops at the time didn't have any sort of theme tunes (for a good reason, I might add). Both the ATARI and C64 versions are quite rich in sound effects, however. Everything imaginable has a very good and recognizable sound effect: you get a sound for your jetpack, for picking up a man and delivering him to the dropzone, both for shooting and for killing something, using a bomb, and most importantly, the guy whistling for your attention when an enemy planter is closing in on him with an android. Your death is marked with a huge explosion - both graphically and sonically. To be honest, my ears are more accustomed to the SID sounds, so I cannot really say which machine actually has the better sounds for the game, but from the two SID chips, I'd recommend you to play this game with a 6581. Apart from that, I'd say they're equal, because my expertise is more on the musical aspects of sound, and everyone will like the other one better in any case. Eight years later, the NES version gets released with a fairly faithful rendition of everything you'd wish for, including the in-game sounds. But lo and behold, Neil Baldwin from the NES conversion team has given us something extra: a bloody fantastic and unique 45-second theme tune that rivals the best of them, even Tim Follin's Solstice tunes. For this reason alone, this is my favourite version of the game, and I wish every other version had the tune. The monochrome GAME BOY version was released the same year as the NES version, and the conversion was made by the same team apparently. Neil Baldwin must have not been involved with the Game Boy version, however, since you don't get any sort of music here - instead, the title sequence only plays random in-game sound effects on top of the very familiar jetpack noise. The in-game sound effects are good enough, although not quite as effective as on any of the above, and perhaps shockingly, I do prefer a quiet arcade-like title screen over this randomness. The GBC version has the exact same soundtrack, so no news there. If the Game Boy version felt a bit strange with its title screen soundscape, the SEGA GAME GEAR version might shock you in a completely different manner altogether. You do get a theme tune here, but instead of having a good original tune like on the NES, the Codemasters' team decided to go wild an include a full bleepy rendition of Bach's "Toggata and Fugue in D minor". As if that hadn't been used enough in early games already. Perhaps they thought that being an old game, they would go properly retro and include a tune that was overutilized at the time anyway, but play it in all its glory. Although I do enjoy some proper Bach every now and then, this is not my idea of a good joke. There is another tune in the Game Gear conversion, which is played when you get to the high scores table, and it also feels like another classical tune, but I can't really figure out if it is one or an original made to sound like one. The in-game sounds are about as good as those in the Game Boy version, so all in all, I'd say the Game Gear version is just an inch ahead of it in this regard. Although Dropzone was written and released almost 4 years after Defender came into the arcades, the game industry hadn't progressed far enough that this game could have been called anything like outdated. Instead, it explored the capabilities of the Atari and C64 hardware in a way no other game had been able to do until then. Does the game's status on the original machines give it more importance than the latter versions? Perhaps, but does it make the originals any better than the latter versions? I would say, it depends more on the player's skills. Dropzone is definitely an essential gaming experience for any home computer/console gaming enthusiast, particularly for a shoot'em-up fanatic, so if you still don't have one, do yourself a favour and hunt one down for your collection. I couldn't put it any clearer even if I tried to explain it through opinions. Dropzone is a very recommendable game on all the non-handheld platforms, and if you feel an uncontrollable urge to play the game in a car, your best choice is the coloured Game Boy version. Although the C64 and NES versions are undeniably very good, the ATARI is where the game should be experienced, if possible. Then again, you might enjoy the only official sequel more - titled Super Dropzone, available on the Super Nintendo, Game Boy Advance and Sony PlayStation. It adds new weapon types and end-level bosses into the mix, which could be more attractive to shooter addicts who require a slightly more modern touch in their games. Thanks again to ewgf for making the request, I hope this meets your approval! And thanks to all the rest of you for reading once again - hope you enjoyed it. Corrections, suggestions and other comments are as welcome as ever!